An ordinary girl from Planet Earth, Bloom lives a perfectly normal life in the city of Gardenia until she meets Stella, a princess from the planet Solaria, who is in trouble. Coming to Stella's aid, Bloom discovers her magical powers. Stella persuades Bloom to join Alfea, the best fairy school in all the realms. 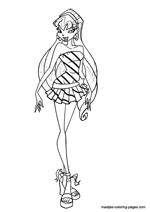 In Alfea, Bloom forms the Winx Club, whose members are her four friends and roommates: Stella, Musa, Tecna, and Flora. Later in the series they encounter and befriend the Specialists: Brandon, Riven, Timmy, and Sky. The Specialists are will also become their love interests. They will also encounter their enemies, a trio of witches named the Trix: Icy, Darcy, and Stormy. They are witches from Cloudtower, a witch school roughly equivalent to Alfea, and are in search of the power of the Dragon's Flame which is supposedly in Stella's magic ring. Their ruthless pursuit of the ring leads to many encounters and battles with the Winx Club. Bloom also begins to learn the secrets of her planet, parents, and powers. 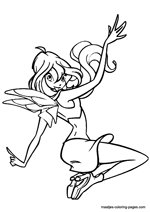 Bloom: She discovered her dormant magical powers after coming to the aid of another fairy, Stella. Strong and caring, she is always available to help her friends. Shortly after arriving at Alfea, she discovers that her powers of fire come from the ancient Dragon's Flame. She is the princess and survivor of the planet Domino,[nb 2] her birthplace. She owns a blueish bunny named Kiko. Her pixie is Lockette, the pixie of mazes and portals. Her magical pet is Belle, a green and white sheep. Stella: She is a talkative and "girly girl" student who often gets average or low grades, but always pulls through with help from her friends. She tends to be spontaneous and dislikes extensive planning, but she is able to recognize when her help is needed. 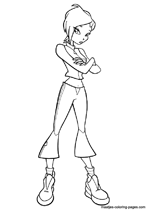 Stella is also infamous amongst the Alfea houses for blowing up a laboratory and being kept back a grade; thus, she is a year older than all the other Winx Club fairies. She has the power of the sun and the moon because her mother represents the moon and her father represents the sun. She is the princess of the planet Solaria , her birthplace. Her pixie is Amore, the pixie of love. Her magical pet is Ginger, a white poodle. Flora: Flora is a very kind-hearted and sensitive girl with a passion for nature and life. Happy and introverted, she is always a sweet, loyal friend and doesn't believe in hurting others or the environment. She is extremely fond of plants and nature and her room consequently resembles a greenhouse. She has the power of nature, which allows her to use plants in her attacks and natural predators to exterminate pests. She comes from the planet Linphea. Her pixie is Chatta, the pixie of gossip. In Season 3, it is revealed that Flora has a younger sister named Miele[nb 3]. Her magical pet is Coco, a pink cat. Musa: Musa loves all forms of music. Although she tries to put up a tough front to isolate herself and is often pessimistic, she is a loyal and caring friend. 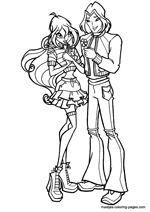 Musa has the best grades of the entire Winx Club (including Tecna). She is a tomboy (similar to Layla). She is pale and has an Asian in appearance, with blue-black pigtails and blue eyes. She has the power of music, and she gets her energy from all kinds of music. She comes from the planet Melody so she grew with music all around her. Her first magic that she used was her flute. Her mother was a great singer and her father a great pianist. Her father would make all kinds of musical instruments. Musa's mother died when Musa was young and she lived with her father. Her pixie is Tune, the pixie of manners, who often gets on Musa's nerves since they are almost the exact opposite of each other in terms of personalities. Her magical pet is Pepe, a brown bear. Tecna: Tecna is always logical and rational, and initially had trouble expressing her emotions. She speaks in a technical and a matter-of-fact manner. She is extremely intelligent and strong in technology and mathematics and enjoys playing video games and dismantling stuff. She can act cold and rational at times, but always tries to do the right thing. She has the power of technology and can control everything provided by technology. She comes from the planet Zenith. Her pixie is Digit, the pixie of technology. Her magical pet is Chicko, a yellow duck. Layla: Layla is the Princess of Andros [nb 5]. She has a restless, rebellious, and wild nature. Layla is a good athlete, fighter, dancer, and wind-raider rider. She is also a feminist and thus opposes Riven, a chauvinist. She is also somewhat of a tomboy (similar to Musa). 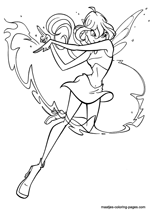 She has the power of fluids and is able to manipulate a pink fluid called "Morphix" to take on any form she chooses. 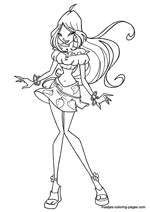 She joins the Winx Club in season two and brings her pixie friends along with her. Her pixie is Piff, the pixie of sweet dreams, who quite frequently helps her with her troubling nightmares. Her magical pet is Milly, a white rabbit. Roxy: Roxy has power over animals. 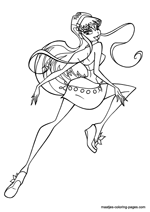 Roxy is the last terrestrial fairy, whom the Wizards of the Black Circle pursue in order to imprison. The Winx fairies' newest mission is to protect Roxy from the evil Wizards of the Black Circle, who are after her. 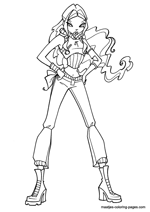 Roxy has waist-length, hot pink hair with yellow tips, and eyes of arbitrarily interchanging violet and amber color. She also lives in Gardenia, just like Bloom, and is described as out-going. The Winx girls noticed her in the coolest bar in town-and got to befriend with her later in the series-where her father and herself work: The Frutti Music Bar. As the fairy of animals, she owns a pet dog, Art�, whom she loves very much and tends with care. Her Fairy outfit theme color was revealed to be dark green, in subtle contrast with Layla's aquamarine tone.